State and local water administrators face a supply emergency that is tightening. 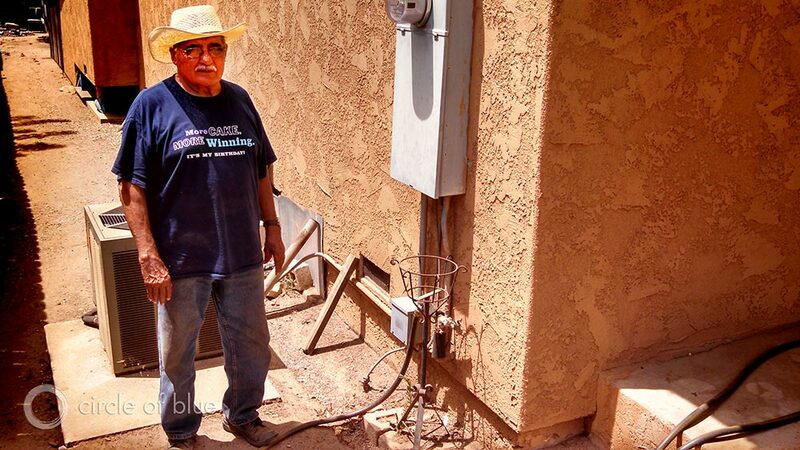 Benjamin Luengas, 83, stands by a hose that runs from his neighbor’s house in Tulare County. After their well dried up in June 2014, Benjamin and his wife, Lala, had no other option for water until a local nonprofit installed a water tank in their home in October. Click image to enlarge. Communities in California’s seared Central Valley and arid mountain foothills are expected to end this year’s rainless summer with drinking water supplies so tight that they may give out by September, according to state and local water administrators. The communities drawing ever closer to running out of water are as varied as California’s kaleidoscopic geography: Sierra Nevada foothill villages; Pacific Coast hamlets that draw from a single creek; unincorporated Central Valley farmsteads with gasping wells; lakeside tracts now with sandbar vistas. Some 72 water systems — most serving fewer than 500 people — received $US 15 million in state grants during the last fiscal year to build pipelines and wells to avert a drinking water shortage. Even more assistance is expected in the new fiscal year, beginning July 1, according to the State Water Resources Control Board. In addition, emergency aid to individuals with dry wells will increase five-fold, to $US 20 million, according to Eric Lamoureux, Inland Region Administrator of the California Office of Emergency Services (OES). The work to develop new water supplies and to use existing water resources in new ways is testing California’s resolve and is steadily evolving into dramatic political battles that, for the time being, focus on water in the Sacramento-San Joaquin Delta, the state’s hydrologic choke point. Farmers and communities whose reservoirs are imperiled argue that river-flow requirements — designed to protect endangered fish species in the Sacramento-San Joaquin Watershed — threaten to deplete reservoirs to the point where public drinking water supplies would be at risk. On April 1, two irrigation districts in the San Joaquin Valley defied federal mandates to release water for fish, and the federal Bureau of Reclamation cancelled the pulse of water from New Melones Reservoir. On the evening of April 10, the two sides came to an agreement on how to balance fish flows and drinking water supplies, and the environmental releases began the next day. Last week, Carly Fiorina, former chief executive of Hewlett-Packard who is considering a presidential campaign, accused environmentalists of causing California’s drought emergency. Fiorina said allegiance to the endangered Delta smelt and the requirements of the federal Endangered Species Act prevented fresh water from flowing to Central Valley farmers. “Liberal environmentalists have prevented the building of a single new reservoir or a single new water conveyance system over decades during a period in which California’s population has doubled,” Fiorina said. California’s drought emergency, now in its fourth year, is challenging cities and towns to acknowledge and respond to a slow-developing crisis that is tightening at every juncture. The consequences, moving ever outward, are spreading from orange groves and alfalfa fields to suburban subdivisions. The availability of drinking water is becoming more urgent — especially for small communities — as reservoirs recede, aquifers contract, and the lowest winter snow levels in state history signify an early start to what will be the driest dry season in centuries. The pressure is unlikely to ease. Though Governor Jerry Brown (D) ordered on April 1 a statewide 25 percent cut in urban water use, a few communities on the brink are setting targets as high as 50 percent. Lake Don Pedro Community Services District, a two-hour drive southeast of Sacramento, is one such place. “The system is going to crash in on itself if we don’t take action,” Peter Kampa, general manager of Lake Don Pedro Community Services District, told Circle of Blue. Kampa has a view from the pilot’s seat. His district — which serves 3,240 people — is seeking state funding for two emergency projects. Though outdoor watering is banned and a mandatory 50 percent conservation edict is in effect, Lake McClure, the district’s supply source, will drop below the water-intake pipes by the end of August. In January 2014, the California Department of Public Health published a list of 17 water systems at risk of running out of water within 60 to 120 days. The list received widespread attention. It was also misleading. Bruce Burton, chief of Northern California field operations for the Division of Drinking Water, told Circle of Blue that a half dozen of the 17 systems did not end up having problems. Those lessons will inform evaluations this year. Field staff will note the systems that apply for funding before declaring them at risk. The immediate project is a stop-gap measure to spend $US 1.6 million to drill three new wells. The larger project is one that Kampa calls “the ultimate drought-hazard-mitigation project” for the community. Kampa outlined a $US 6.5 million plan to extend the district’s intake pumps eight kilometers (five miles) into the deepest part of Lake McClure, a project not unlike what Las Vegas is constructing to ensure water service from Lake Mead as the Colorado River ebbs. There is no start date for the pipeline project, Kampa said, because it is completely reliant on outside funding. Systems like Lake Don Pedro that serve fewer than 3,000 people are most vulnerable in a severe drought. Often they rely on a single source of water: a well, a creek, or a small reservoir. In many cases, they do not have enough money in the bank to pay for a project that must be built within months. With so few ratepayers, the cost per person for a need-it-now, multimillion-dollar project is beyond reach, according to Kampa. Building the Lake McClure pipeline would cost every resident of Lake Don Pedro $US 2,000 if paid for out of pocket. That is why state aid is a lifeline for these hobbled places. For the 72 public systems that received $US 15 million in emergency funding between July 2014 and June 2015, the money went in several directions. It paid for new wells or pipelines to access a secondary water source. It helped struggling communities tap into a larger neighboring system that was not at risk of shortage. Montague, for example, received $US 1.3 million to build a five-kilometer (three-mile) pipeline from the Shasta River directly to the town’s storage ponds. The pipeline was needed because the irrigation canal that normally channels water to the town of 1,400 people near the Oregon border began to dry up last summer, and the cracked ground pulled in the water like a sponge before it could reach Montague. The pipeline now moves water without sacrificing any to the soil. “We can operate with normal deliveries this year,” said Chris Tyhurst, Montague water superintendent, in an interview with Circle of Blue. More money is coming for others in need. On March 27, Governor Brown signed a $US 1 billion drought package that includes $US 134 million for drinking water for small communities. An undetermined portion of that money will be used for emergency projects, according to Andrew DiLuccia, State Water Resources Control Board spokesman, but much of it will go towards longer-term fixes for rural towns. “While it will help in some of those instances, large chunks of this money will be used for projects that will help communities secure reliable water resources, and these projects will take years to complete,” DiLuccia wrote in an email to Circle of Blue. California agencies provided $US 19 million in emergency funding last year for failing water systems and for residents with dry wells. With the drought worsening, more money is coming. Click image to enlarge. The widespread failure of private wells was an unexpected disaster last year. Officials anticipate that the problem will worsen this year in the Central Valley, a key farm region where groundwater levels have never been lower. Because farmers are receiving little or no water from canals, pumping from aquifers will continue full bore, causing the water table to drop below the shallow residential wells. “These are conditions we have not seen before in California,” Lamoureux told Circle of Blue. Of the 1,700 dry wells that have been reported to the state since last year, more than 1,000 are in Tulare County, a Connecticut-sized patch of the nation’s most lucrative farmland. The number of dry wells in Tulare could double, reckons Andrew Lockman, manager of the county’s Office of Emergency Services. As the groundwater crisis developed last summer in Tulare County, well owners found themselves in legal purgatory. State law is designed to assist failing public water systems, not individuals with failing wells. State action was swift and effective for systems that supply 15 or more connections, the definition of a public system. But well owners had no such access to state grants. Moreover, federal dollars from the U.S. Department of Agriculture’s household well program were scarce, and local governments and nonprofits could not keep pace with the strain of hundreds of wells turning to dust in a matter of a few hot August weeks. Many of the farmworker families could not afford to spend $US 20,000 or more to drill a new well. Instead, they hauled water in 150-liter (40-gallon) drums or ran hoses to a neighbor’s house. Some relief came in September, when Governor Brown authorized the use of California Disaster Assistance Act funds for residential well owners, the first time the emergency aid program had been used for drought, according to Lamoureux. Through the act, the state reimbursed local agencies for the cost of providing water tanks, portable showers, and bottled water to families with dry wells. Government agencies had 75 percent of their expenses reimbursed, while nonprofits were covered 100 percent. OES will have provided an estimated $US 4 million through the disaster act during fiscal year 2015. Lamoureux estimates that $US 20 million will be available for the next fiscal year, which begins July 1. Tulare is one of three counties along with Mariposa and Tuolumne that are part of the OES water-tank program. The program provides residents with a 5,700-liter (1,500-gallon) tank that is connected to the home’s plumbing. The state pays to have the tank refilled by water truck. Only 50 such tanks, however, have been installed in Tulare, according to Lockman. Still, the tanks are a “band-aid,” Lockman said. The county’s goal is to connect as many people as possible to public water systems. By the end of the month, 100 residents of Cameron Creek will be hooked into the system of Farmersville, a neighboring town, thanks to $US 1 million in grants from the U.S. Department of Agriculture and the State Water Board. I suggest a four-pronged approach which would provide all the water the state needs, but there would have to be a more centrist (vs. Liberal) approach to California’s governance. And we wouldn’t have to continue hurting the state’s agricultural industry. 1) The Federal Government needs to back off its ill-advised over-protection of the Delta Smelt and allow it to be re-located. And CA needs to add more canals to send more water to Central and Southern CA from the Sacramento River/San Joaquin River Delta so that less of this precious resource goes straight to the ocean. 2) And maybe with cheaper energy CA could afford to increase its number of desalinization plants. That would also require the Environmentalists to back off their emotional hatred of nuclear energy, off-shore drilling, fracking, and having more refineries. The pendulum needs to swing back from the extreme environmentalism to a balance with the needs of the people of CA, including both its farmers and its consuming citizens. 3) Since 70% of CA’s rainfall ends up flowing into the ocean, they need to build dams and reservoirs. But this will require the Environmentalists and white water enthusiasts to back off their anti-dam propaganda and lawsuits. 4) Lastly, if CA could acquire the courage to reduce the benefits for illegal aliens, then more of them would self deport and far fewer would enter the state. A conservative reduction of 10% of the population could create nearly half of their water usage reduction goal. If less water flows to the ocean the salt water will flow in and polute bay delta ag land with salt. More canals will not help if no water to put in them. Ag can not continue to take as much water as it does. Even during wet years they pump so much groundwater that they still overdraft supplies of it. Why don’t we pay farmers NOT to grow useless crops like rice. I think the world can live without rice, barely and alfalfa…. The world could live without alfalfa? I guess you do not buy milk, cheese, ice cream and all other dairy products. Beef would be $25 a pound also. Go hug another tree moron.